I was cleaning out an old desk that has traveled with me since my undergrad days and found a massive stash of old floppy disks. I don’t have a computer that can even take them anymore, so they were all tossed in a box to be sent off and recycled. But check out this little gem. 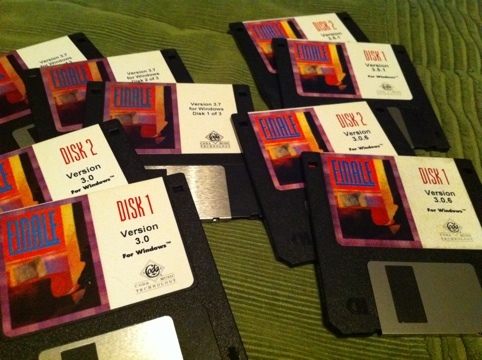 My original Finale install disks from 1994! How far we have come. I remember walking back to my dorm with the monstrosity that was the instruction manuals that went with the program. Three massive books in a box that barely fit in my backpack. I got something in the mail today from ASCAP today. Usually this is a statement showing me my royalty reimbursements. For concert and orchestral writers, along with any broadcast media, royalties are collected for university, conservatory, and professional performances. Since I write mainly music for high school marching band and there doesn’t seem to be a strong calling for marching band music on the radio, I’m used to seeing a statement with a giant zero on it. Imagine my surprise when it wasn’t that and was instead a letter telling me that I had won an ASCAPlus award! For writers who have a body of work that falls outside of traditional royalty collections, you can apply annually for one of these awards. It’s a nice way of acknowledging somebody’s effort and work in what they consider “non-traditional venues”. Suffice it to say, I’m really pleased. I can think of a number of other composers in the field who I have high respect for who have also received this. To be added to that list is an honor.